Today Sarah and I headed to Cedar Point to catch some of their live shows. During the morning hours we hit several of the rides, as the shows didn't start until after noon. We ate at T.G.I. Friday's in Hotel Breakers. The food was great as usual. The first show we saw was Rock Band: LIVE in the Jack Aldrich Theatre. Prior to the show there are auditions just outside the theater on the midway for members of the public to be join the cast on stage and be part of the show. It is a comedic story of rockers making their way from a garage band to glam-rock arena gods. As with any good rock show there were plenty of lights and smoke. The best show of the day was Tropical Heat, Island Beat at the Red Garter Saloon. This high-energy show gets high marks for it's live band and two great lead singers. Cedar Point should really make more of their shows feature live bands. Sarah and I truly loved this show. We made two efforts to see the All Wheels Extreme at the Extreme Sports Stadium along the beach, but the show was cancelled due to the rain. We were lucky getting into the shows and the restaurant when we did, because it gave us shelter from the off-and-on rain showers that continued for most of the day. We weren't so lucky while walking along Frontier Trail and through Frontier Town. We got soaked. 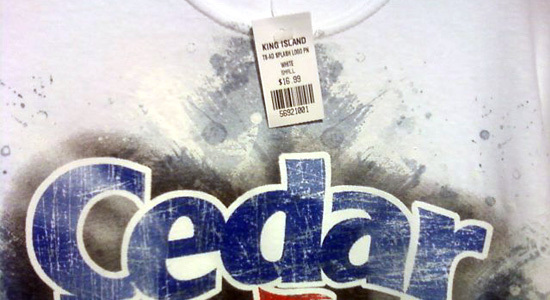 Late in the day Sarah was looking around the shops when she found a Cedar Point T-shirt with a Kings Island tag. There was a time just a few years ago when something like that would have just felt dirty. We had another great day at our favorite park while taking a different approach with the entertainment choices.